It was made by performance company A2 and commissioned by Nuffield Theatre, Lancaster (funded additionally by Awards for All). 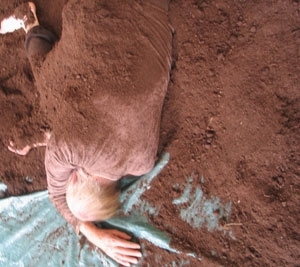 This was an evolving performance installation in which 38 local people, ranging in age from 3 to 75, gradually buried each other with earth, following workshops exploring the inter-relationship between Living & Dying. London based A2 Company is a collaboration between artists Anton Mirto & Alit Kreiz. Together they create contemporary performance, installation projects, & educational events exploring new personal, social & emotional language forms, which aim to interrogate & reflect the human experience.